When the U of S Huskies women’s basketball team lost their first home game of the season last month, they did not realize what kind of streak had slipped away. At the time, the team was boasting a 32 game winning streak on home court—a mere 10 games shy of breaking the standing record of 42. Though Head Coach Lisa Thomaidis said the team had not been tracking their home game wins until media pointed them out, the players were still able to take some good lessons away from the upset. "I think the silver lining in it is that it really helped to re-focus our team and to expose some of the weaknesses that we definitely have. We're not going to be able to just get by on talent. That weekend, in particular, it was the defensive side of the ball where we struggled," Thomaidis said. Huskies women's basketball has been on a hot streak all season. The team spent the majority of the season leading league rankings and, on Feb. 24, were part of a social media sensation when a Twitter photo appeared of Prime Minister Justin Trudeau proudly hoisting a basketball signed by the entire squad. With the end of the season in sight, Thomaidis and fifth-year guard Laura Dally were named Canada West Coach of the Year and Canada West Outstanding Player of the Year, respectively. Last weekend, the U of S hosted the Canada West Final Four Championship for the first time since 2011. In a win against University of Regina Cougars in the final, the team capped off league play with another CanWest title, the fourth in program history. "It's been a fantastic year and, to be honest, the players who have experienced this and who have gone through it deserve it," Thomaidis said. "There are a lot of fifth-year athletes who are finishing up their careers, and to have them experience that recognition and to get that notoriety is well deserved. It doesn't just happen by chance. They've earned this." Dalyce Emmerson is one of those fifth-year athletes, bowing out from her final year of play as both a champion and three-time all-Canadian player—an accolade she has every chance of winning for the fourth time, given this season's play. Still, she remains humble about the prospect. "If you ask anybody on our team, nobody cares about the athletes of the week or anything like that. Those are on the back burner. We want the big team wins and the team awards," Emmerson said. 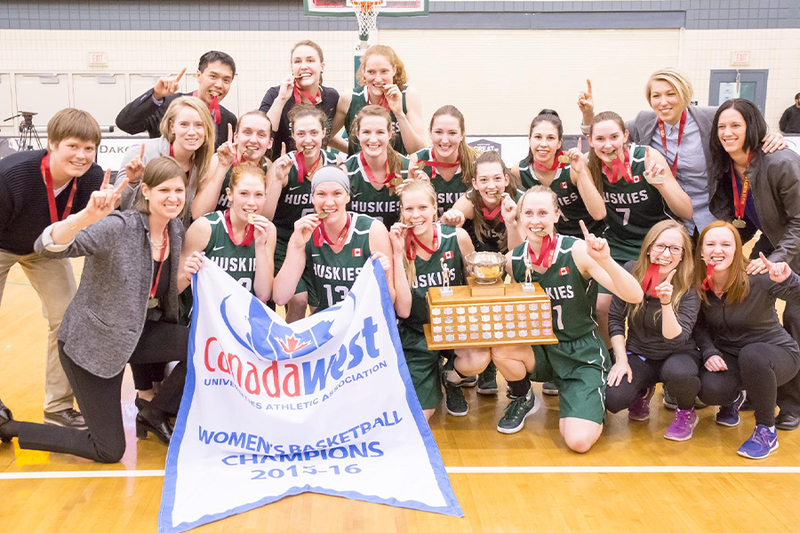 Up next for the Huskies is the Canadian Interuniversity Sport (CIS) national women's basketball championship, held at the University of New Brunswick in Fredericton, N.B., March 17-20. Emmerson, who has gone to nationals three of the four previous years without bringing home the title, thinks the team's outlook is positive. "In other years we've felt good. We've known that we played well and earned our spot there, but this is the first year I think that we all feel we can actually do the job and bring it home if we're all on the same page and the wheels are rolling properly. It just makes it that much sweeter knowing that it's actually possible for us." Looking forward, Thomaidis said the team is less interested in chasing another home game-winning streak. Instead, they are more invested in heading into every game ready to face off against their next opponent. "It's not really about the streak. None of us really paid attention to that until the media pointed it out. It's not about that for us. Every weekend, it's about getting these two wins and getting the next two," Thomaidis said. "It's more about wanting a two-game winning streak each weekend." Huskies women's basketball is not the only team that has seen great success this past year. Elsewhere on campus, the dogs have been sprinting toward success on the field, slamming their opponents on the mat and earning the spotlight at the national level. Men's track and field: Won Canada West championship. Fifth- year Jared Olson named CIS men's track and field Student-Athlete Community Service Award winner and captured the gold medal in the men's 60m hurdles at the CIS Championships. Graham Black, Jared Olson, Adam Paslawski and Garrett Peters earned gold in the 4x200m relay. The team of Graham Black, Ryan Kowalchuk, Garrett Peters and Jaden Porte also won gold in the 4x400m relays. Men's hockey: Won Canada West championship and will compete in the University Cup March 17-20. Jordan Cooke was named Canada West Most Outstanding Player and Top Goaltender. Kohl Bauml was named Canada West Rookie of the Year. Wrestling: Men's team won its first Canada West title since 1986. Josh Bodnarchuk (57 kg) won his second consecutive CIS gold medal and was named Canada West Male Wrestler of the year. Kiera Prior (82 kg) won the CIS silver medal and was named 2016 CIS Female Rookie of the Year. Andrew Johnson (82 kg) won CIS silver medal. Annie Monteith (48 kg) and Katie Dutchak (51 kg) received CIS bronze medals, and Dutchak was named Canada West Female Wrestler of the year. Men's volleyball: Won silver at Canada West final, currently pursuing national championship. CJ Gavlas named CIS Rookie of the Year. Robert Graham was given the Dale Iwanoczko Award. Women's basketball: Won Canada West final, currently pursuing national championship. Head Coach Lisa Thomaidis named Canada West Coach of the Year. Laura Dally named Canada West Most Valuable Player. Laura Dally and Dalyce Emmerson named Canada West First Team All-Stars.